One of Clancy's biggest admirers was Conn Smythe, the architect of the Maple Leafs. Clancy aggressively pursued the acquisition of this player more than any other, as he knew that no other player could have such an impact on his new Maple Leafs team. Smythe, a celebrated gambler, took a big chance in the minds of most when he traded away Eric Pettinger, Art Smith and $35,000 cash in exchange for Clancy in October of 1931. It was the biggest deal in hockey history at the time. The financially troubled Sens jumped at the deal as the Great Depression was in full swing, but the team was never the same on the ice. So many great stories involve King Clancy, especially when his temper got the better of him. Weighing only 150 pounds when he broke into the league, Clancy was never afraid to take on players much larger than himself. Legend has it Clancy once even challenged an unruly Boston fan to have it out with him after the game ... only to be told he had tried to pick a fight with Jack Sharkey, the heavyweight boxing champion of the world. Clancy never did stop annoying people, and rarely faired well in any one on one fisticuff. Another incident involved Harold Starr also of the New York Rangers. Starr was an extremely physical blue liner who also suited up as a professional wrestler. Some people might say that should be reversed: he was a pro wrestler who also played NHL defense. In a certain game, legend has Starr picking Clancy up over his head in the old and famous wrestling hold the "airplane spin." Starr would then proceed to toss King over the boards into the lap of a spectator. 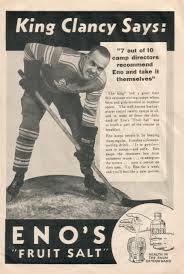 Clancy led the Leafs to their first Stanley Cup in 1932, just his second season in Toronto. .
Clancy was an outstanding rushing defenseman, totaling 136 goals and 143 assists before retiring early in the 1936-37 season. Though primarily a defenseman, Clancy played every position including goal! In these old days if a goaltender got a penalty he had to serve the time in the penalty box. This happened twice - December 27 1924 (allowing no goals in 2 minutes) and on March 15, 1932 (allowing 1 goal against in 1 minute played). One of the most amazing nights in NHL history came on March, 17, 1934 - St. Patrick's Day not coincidentally. The Leafs and their fans honoured Clancy with King Clancy Night. They showered him with gifts as if he were real royalty. And they gave him a big crown and regal clothing to wear. And for the game they allowed him to wear a green Maple Leafs jersey with a shamrock on it, although he agreed to take it off by the second period as the opposing team complained the jersey was confusing and distracting. Imagine that - a green Maple Leafs jersey! Following his retirement as a player, he then became a referee for 11 years. He returned to coach the Leafs from 1953 to 1956, then moved up to become assistant manager, although he did return for a stint as interim coach in 1971-72. In the 1990s the NHL remembered Clancy's love for the game by announcing the King Clancy Memorial Trophy, which would annually be awarded to "the player who best exemplifies leadership qualities on and off the ice and has made a noteworthy humanitarian contribution in his community." Any idea where his daughter Carol is? I do know that his grand daughter, maybe great granddaughter, lives in niagara on the lake.